Looking for the best Bluetooth speakers deals? You're in luck. This is the best place to find them. Read on for our top picks of cheap Bluetooth speaker sales that include top brands such as JBL, Bose, and Sony. These wireless speakers are the best way to upgrade the sound of your phone, without spending a fortune. It's hard to beat the sound-to-cost on some of the best budget wireless speakers listed below that are all currently on sale. Why would you want a Bluetooth speaker in the first place? These awesomely convenient and extremely portable powerhouses get you the sound of a small hifi and you can take them anywhere. It's perfect for BBQs, days in the park or just carrying around the house. Use one and you'll immediately see why they are so popular. Instead of the mess of cables and docks that you normally need to get music playing out of a set of speakers, with a Bluetooth speaker it’s as easy as pairing up your phone, opening your music app of choice, and getting your favorite songs playing. The best also sound many times larger than they actually are, ready to blast out tunes at party levels. 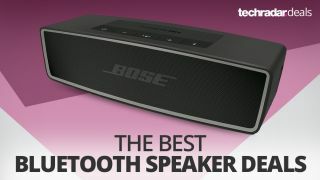 Unlike our guide to the best Bluetooth speakers (which are ranked on quality), these have been ranked in order of price from cheapest to most expensive. Pay more and you’ll get features like better battery life and more complete water-proofing. However, every speaker in this list is a winner, offering great sound for the money and size. Looking for a super cheap waterproof Bluetooth speaker? Look no further. The JBL Clip 2 may be petite, but it has powerful sound and a long-lasting battery. It's completely waterproof – which makes it a perfect companion for a pool or a day at the beach – and it can be hooked up to a second JBL Clip speaker for some sweet stereo sound. Cheap and convenient all in one package. If you want a budget waterpprof Bluetooth speaker, then the Creative Muvo Mini is the one to buy. It takes all the features you could want in a Bluetooth speaker such as weather-proofing and a decent battery, and combines them into a surprisingly affordable package. As far as deals go, there are few better than the ones you can find on last year's JBL Flip 3. This awesome-sounding Bluetooth speaker has great bass response, its mids are rich and highs are crisp. This speaker offers a 3,000mAh internal battery that's capable of about 10 hours of life and an internal microphone that allows you to pick up calls by pressing the phone button. On its back, there's a microUSB port for charging the Flip 3 and a 3.5mm input for wired listening. Planning on taking your speaker beach-side? Be sure to pack a UE Roll 2, a speaker that's waterproof, compact and fits great in a bag. It boasts a 50-foot wireless range, exceptional clarity around the mids and highs and won't malfunction after a little splash. There are plenty of other great Bluetooth speaker deals out there but, if you want a speaker with a wild design, this level of sound performance and an unbeatable, 50-foot wireless range, Ultimate Ears's Roll 2 is the epitome of water-resilient audio equipment. Another option from Ultimate Ears is the brand-new UE Wonderboom. Unlike the Roll 2, it's capable of 360-degree sound, which is perfect for parties where people are a bit more dispersed, and amps up the bass. All that said, the UE Wonderboom is one of the best waterproof Bluetooth speakers you can buy. It’s completely waterproof, offers true 360-degree sound, features a 100-foot range and can pair two devices simultaneously. If you're looking to liven up your living room, one viable party route to go down is Sony's SRS-X11 Bluetooth speaker. This little cube packs 12 hours of battery life in a 2.4 x 2.4 x 2.4 inch (W x H x D) shell and outputs 10w of power. It has a decent frequency response of 20–20,000 Hz (with 44.1 kHz sampling) and only weighs around 7 ounces. Cheap, light and moderately powerful? Win. Need something a bit bigger for your next party? Check out the Ultimate Ears Boom 2, the reigning champ of our Best Bluetooth Speaker guide. The UE Boom is ultra-powerful and, like the UE Roll and UE Wonderboom, is 100% splashproof, making it the perfect companion for any outdoor adventuring on your agenda. If you're deep in the search for your next – or first – Bluetooth speaker, you can stop looking now. You've found it. Razer might be comparatively new to the Bluetooth speaker game, but the Leviathan Mini does a lot right. When we originally reviewed it we thought that the speaker was a little pricey for what it offered, but now that it's been on the market for a while its price has come down substantially, making it a much easier product to recommend. Bose is a brand more commonly associated with high-end audio gear, but the company is also more than capable of putting out decent budget offerings, and nothing shows that off more than the SoundLink Color, which sounds great for the price.